Both puppies are suffering from deadly parvovirus but were abandoned inside a church doorway when they were desperately in need of urgent veterinary care. The lurcher puppies, both aged around 20 weeks, are the latest victims of dog dumping spike faced by animal rescuers in the countdown to the Christmas holidays. They were found in the porch of St Peter’s Church in Rectory Lane, Banstead, Surrey, earlier this week by its vicar who alerted the RSPCA. Animal welfare officer Carl Hone described how a man in a pink shirt was spotted running towards a grey people carrier with a woman passenger parked outside the church. Mr Hone: “The man who did this consciously made the decision to abandon these two innocent dogs and leave them in freezing conditions in very poor health. The pups were left in a pink and white fleece blanket. 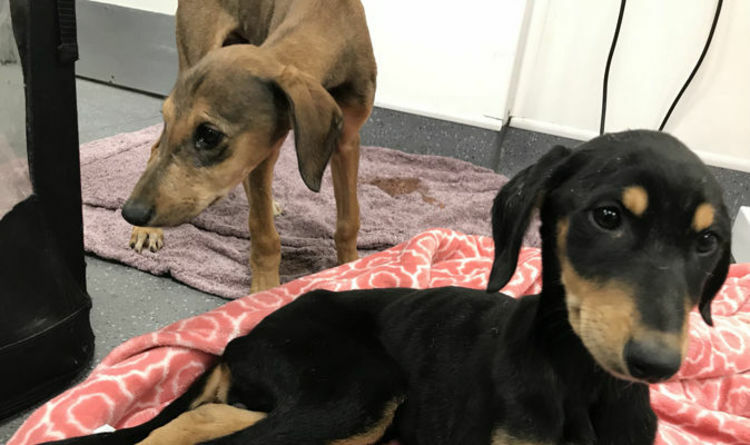 Both tan-coloured Paul and black and tan Peter are at the RSPCA’s Putney Hospital receiving intensive veterinary treatment for parvovirus. Mr Hone said: “They were in poor condition when they were discovered, and suffering from this very dangerous condition. Both puppies were described as “very underweight and lethargic” when they were found. The RSPCA is now warning dog owners in the area about the presence of parvovirus. Mr Hone added: “We’re keen to also alert dog owners and encourage them to remain vigilant and if they suspect their pet is sick, take them straight to a vet. “Parvovirus is a highly contagious viral disease with a high mortality rate among untreated dogs, so we would encourage owners to ensure their pets are vaccinated to help avoid the heartbreak of losing a much-loved pet to the disease. “Parvovirus vaccine is included in the standard vaccinations every dog should receive from around seven weeks of age with a second vaccination required to complete the course, then yearly boosters. Anyone with information about the puppies is urged to contact the RSPCA appeals line on 0300 123 8018.